PROFESSIONAL RACE (PRO-RACE) TOP MOUNTED COCKPIT FIT 3 PEDAL, HYDRAULIC CLUTCH, BRAKE BIAS PERFORMANCE PEDAL BOX. 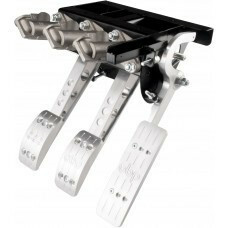 KIT CONTENTS: PRO-RACE 3 PEDAL HYDRAULIC CLUTCH PEDAL BOX WITH BIAS BAR & 3X MASTER CYLINDERS. YOU WILL RECEIVE THE NEW V2 VERSION OF THIS PEDAL BOX THAT WILL HAVE FULL ALUMINIUM BILLET PEDALS. OPTIMUM BALANCE PRODUCTS LTD (OBP MOTORSPORT) PRO-RACE RANGE OF PEDAL BOXES ARE PROVING TO BE VERY POPULAR WITH RACE TEAMS WORLD WIDE. THESE PEDAL BOXES REPRESENT A MAJOR STEP FORWARD IN CAR CONTROL, GIVING THE DRIVER BETTER FEEL, GREATER DEXTERITY AND THE MOST IMPORTANT BIT A QUICKER LAP TIMES. PLEASE LOOK OUT FOR SUB STANDARD COPIES OF THE OBP MOTORSPORT PEDAL BOXES. THE PRO-RACE RANGE IS LIGHTWEIGHT, FLEXIBLE AND ERGONOMICALLY EFFICIENT. ALL 3 PEDALS PIVOT ON OIL IMPREGNATED BUSHES, GIVING AN INCREDIBLE SMOOTH MOTION WITH VERY LITTLE MAINTENANCE. ALL OUR PEDAL BOXES ARE MANUFACTURED BY PROFESSIONALS FOR PROFESSIONALS IN OUR OWN FACTORY BASED IN THE UK.